What Does Scabies Rash Look Like? Do you think you might have a scabies rash? This highly contagious problem affects millions of people each year. In most cases, mild scabies is written off as a bug bite or two, but then it gets worse. This itchy skin condition is caused by a tiny mite that burrows under the skin, leading you to itch all over, especially at night. The little mite can spread very quickly, which is why it is common for kids in the same classroom. Because it spreads quickly and easily, treatment for even mild scabies should be started immediately for all family members. A scabies rash is actually an infestation, which means that the mite must be eliminated in order to get rid of the problem. Scabies is very contagious, but you can only get it through close contact. That’s because the mites don’t fly or jump – they must be transmitted directly from the skin of one person to the skin of another. Understanding the question "how do you get scabies" is easy, but the answer to “how to avoid scabies" is much more difficult. That’s because scabies can be spread through very simple contact, such as holding hands or even sitting close together on a school bus. However, the more skin-to-skin contact you have, the more likely scabies will be transmitted. That’s why a scabies rash can develop soon after you have sexual relations with someone who is already infested. Skin-to-skin contact to get the scabies rash usually takes 15-20 minutes, so it isn’t instantaneous. 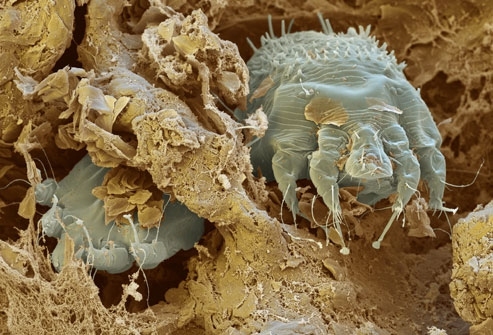 Keep in mind that the mites can only live away from the skin for about 36 hours at the most. That means you are unlikely to catch scabies from towels or bedding. However, if you use the linens in the same way as the other person does – for instance, if you are sleeping in bed with them – you might wind up with a scabies rash. The first sign of a scabies rash is itching, even before you see any signs. Scabies rash is usually made up of tiny red bumps or blisters which usually spread over one particular area of the body. For young children, the rash is usually on the face, neck, palms, head, and soles of the feet. For adults, it might show up anywhere. When you scratch the scabies rash, it makes it worse, and the bumps can turn into sores. That can then lead to an infection. Many people mistake a scabies rash for a simple bite from a bug, such as a mosquito or flea. But over time, the rash gets worse. What's more, you need to know that not every bump you see has a mite underneath; there are usually no more than 10 to 15 mites on a person, even though it might feel and look like a lot more. Lindane. This chemical treatment might be a cream, lotion or shampoo, depending upon the area where you have a scabies rash. It is very strong and should not be used by pregnant women, young children or those with compromised immune systems. Eurax. This is a non-chemical application that is perfect for young children and even babies. It should be applied as directed by the doctor. Elimite. This is a very popular medication that is filled with chemicals that target the mites. It is important to leave the cream on the skin for several hours. It can be safely used by almost anyone, including pregnant women. Stromectol. Those who have compromised immune systems or are facing a tough case of scabies rash might take this medication, which comes in pill form. Always see a dermatologist to diagnose scabies. Remember that this is not a “dirty” problem – many people get scabies, even little infants. Before applying the medication, get as clean as you can. The medicines should be slathered on clean, dry skin that has been recently cleaned. Keep the lotion or cream on for anywhere from eight to fourteen hours, as directed by your physician. Apply the medicine from the top down, from your neck to your toes. Even if you feel as though you have only one area of scabies rash, the mites could wind up elsewhere on your body, so treat it all. Wash everything you come into contact with, including bedding, clothes and towels. Vacuum your entire home and clean around your baseboards, as well as the crevices of your mattress. You want to kill all the mites at one time. When you do clean your house, use the hottest water in the washer, and the hottest heat in the dryer. If you can’t wash something, seal it up in plastic for at least one week. Don’t bother treating your pets – the mites can’t survive on them, so they will not get a scabies rash.